The Wild has found a productive order for its back-to-backs this season, with No.1 Devan Dubnyk going 2-1 in the first test and backup Alex Stalock 3-0 in the second. And the team is sticking with that plan this weekend, as Dubnyk is starting Saturday at home against the Sabres with Stalock tabbed for Sunday’s tilt in Chicago vs. the Blackhawks. Winger Zach Parise is good to go after missing the 6-2 win over the Canucks Thursday with illness, but forward Matt Hendricks – who jumped into the lineup amid Parise’s absence – isn’t taking a seat against the Sabres. Center Joel Eriksson Ek is. 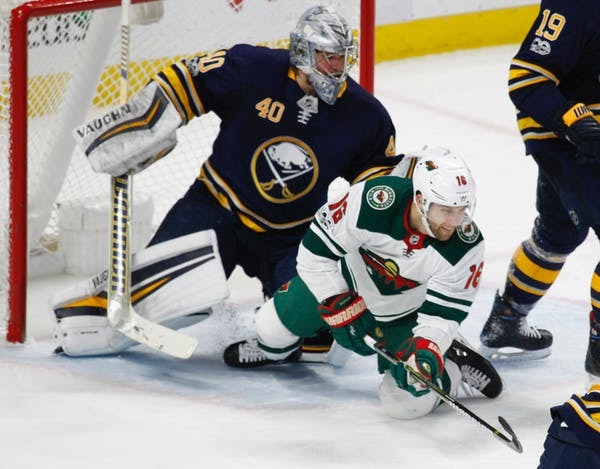 Although the Sabres are finishing off a back-to-back, they’re poised to present a stiff challenge for the Wild – especially since Buffalo outlasted the Jets in Winnipeg Friday night in a shootout to win 2-1. 2: Wins over Buffalo last season for the Wild. 1.85: Goals-against average for Dubnyk vs. the Sabres in his career. 600: Career games for center Eric Fehr. 3: Power-play goals for the Wild in the last two games. 10: Points for captain Mikko Koivu in his past six games. At 11-6-2, the Sabres are sitting third in the Atlantic Division with 24 points. They’ve won four in a row and after their win Friday, they’ve improved to 5-4-1 on the road. Winger Jeff Skinner has 14 goals, the second-most in the NHL. His 21 points pace the Sabres. Center Jack Eichel’s 20 points rank second on the Sabres.